Weekender is the simple way. It matches your desire for style and mobility without the hastle. 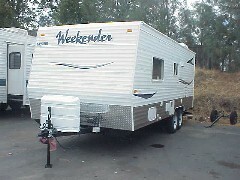 It's small enough for Saturday tailgaters and large enough for long weekends at the lakeshore. Hook up and go! And ya know... this is not a stripped trailer. No way! 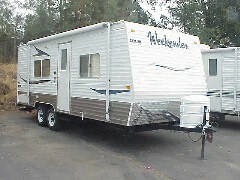 It's fully equipped, fully self contained, and it comes with everything you need to go camping right off the lot. We get you started!